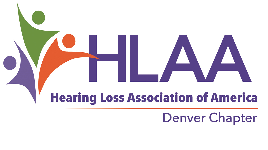 Welcome to the website of the Denver Chapter of the Hearing Loss Association of America (HLAA-Denver). We are the local chapter of the national organization, Hearing Loss Association of America (HLAA), the nation’s leading organization representing people with hearing loss. HLAA seeks to enable people with hearing loss to live fully and without compromise. We meet the 3rd Saturday of every month, September - June at the Englewood Public Library. Please join us for a light lunch and social time at 1:00pm. Programs start at 1:30pm. All our meetings are accessible with CART (captioning) and a hearing loop! Click HERE for information about our speakers.